I thought today I would write about a beer instead of a bar. 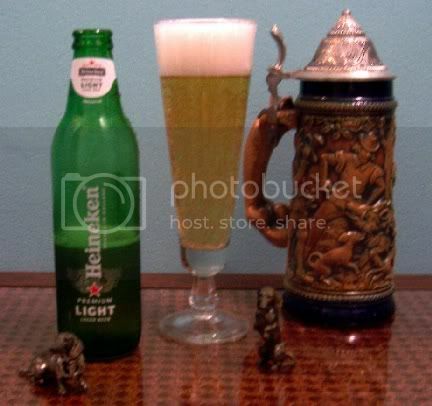 I was contacted by a representative of Hass MS&L, a public relations firm that has Heineken as one of their clients. They asked me if I would do a post on my blog for a new beer if they sent me a sample. Well, those of you who have been following this blog know that I couldn’t turn down a deal like that. I mean after all, free beer that arrives in the mail. What could be better. Now, I must admit that I am not really a fan of light beers and seldom drink even the run-of-the-mill domestic lagers due to their lack of any real taste. Perhaps because I have just returned from Mexico where I pretty much drank nothing but Corona and Pacifico, which are also fairly light beers, the Heineken Premium Light didn’t taste too bad. It does have a bit of the Heineken flavor to it but, like all light beers, has a bit of a water back-taste as well. Still, if one is bound and determined to have a light beer, this one is as good as any and better than most. I guess a lot of people do like light beer because it currently accounts for almost 50% of the total volume sold within the United States beer market. I guess that accounts for why Heineken is jumping into it. Be sure you notice the new slimmer and taller bottle with the vertical logo on the label, makes you feel a bit thinner just looking at it. The packages have silver as the dominant color to suggest both premium and light. Clever, aren’t they. I won’t be making Heineken Premium Light my beer of choice, but that is because my personal taste runs to the heavier, more robust flavored lagers and ales and on into the porters and stouts. Still, if I was participating in one of those strenuous athletic events such as softball, golf, fishing, or bowling where you are expected to dump down a six-pack or two, this might make a decent brew to quaff.